Uganda's Makerere University is one of the oldest and most prestigious in Africa. It's been shaken by a wave of sackings and accusations by the vice chancellor that indiscipline amongst staff was rife. The row began shortly before Christmas when Makerere University dismissed 45 members of its academic staff. The purpose of this was said to be to stamp out indiscipline. Vice Chancellor Barnabas Nawangwe also suspended the chairperson of the Makerere University Academic Staff Association (MUASA), Dr. Deus Kamunyu, as well as Barnett Magara, chair of the Makerere University Administrative Association (MASA) and Joseph Kalema, secretary general of the Administrative Staff Association. Nawangwe's actions have led students to complain that the university is being run by a "vindictive" vice chancellor who is determined not to spare anyone who speaks up. The university reopened for the second semester on January 19 but without the sacked lecturers. The student's guild has threatened to strike if the current standoff is not resolved swiftly. The suspended lecturers have roundly criticized Nawangwe's management style and accuse him of victimization. Deus Kamunyu said he felt he had been targeted for some time. "It started last year in April. I have been waiting for this kind of action -- because I started asking questions that are critical on the running of an institution, to maintain the wellbeing of the workers and to make sure that every worker is respected." Nawangwe has rejected accusations that he was acting like a dictator. "I studied a little bit of philosophy and political science and I know what dictators are. If I was a dictator, a lot of things could have happened in this university." He remained adamant that the sackings had been necessary as a disciplinary measure. "Calling me a dictator, I believe, are people who have become used to impunity and indiscipline. There must be sanity within the university." Among those sacked by the university is also feminist academic and gender activist Stella Nyanzi, 44, who attracted widespread attention in 2017 when she famously referred to President Yoweri Museveni as "a pair of buttocks." Her ongoing court case has been adjourned to February 15. Critics say the latest row is about more than a few rebellious academics. They claim the vice chancellor is using the so-called fight against indiscipline as a way of facilitating President Museveni's long desire to silence those who openly oppose his administration. Museveni has called on universities to promote intellectualism, prompting the response that intellectualism cannot be exercised in an environment of repression. "You cannot have intellectualism without debates, without differences, without schools of thought. Without any form of rigorous processes or form of criticism that is tailored towards public good," Deus Kamunyu said. 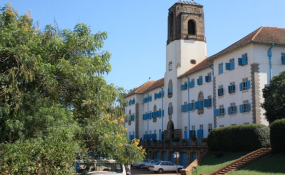 Makerere University was established in 1922 as a technical school. Today, it is regarded as one of the most prestigious universities in Africa. It boasts several prominent alumni, including former president of Kenya Mwai Kibaki and former Tanzanian leader Julius Nyerere. Sudan: Could Army-Backed Protests Topple Omar Al-Bashir?